The Ministry of Health announced on Monday that the death toll of Al-Warraq's Keniset Al-'Adra (Church of the Virgin Mary) attack increased to four while the number of injured rose to 18. Unknown assailants opened fire late on Sunday during a wedding ceremony held at the church in Al-Warraq, a working class neighbourhood in Imbaba, Giza. The assailants have not yet been arrested nor has any group claimed responsibility so far. The victims killed in the attack are eight-year-old Miriam Ashraf, 12-year-old Miriam Nabil, 45-year-old Samir Fahmy and 56-year-old Camilia Attiya, the groom's mother. 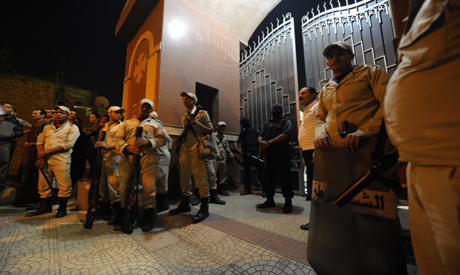 A security source told Ahram Online that an automatic weapon was used in the shooting and that unknown assailants on a motorbike had managed to flee the scene. The source added that the Ministry of Interior has set up a number of check points in the area to round up the assailants. The general prosecution began its investigation by questioning injured victims, survivors and eyewitnesses. In exclusive statements to Ahram Arabic news website, church pastor Bishop Dawoud Ibrahim denied that the attack was related to family disputes in the area. The pastor also added that the church was hosting three wedding ceremonies during the attack. So you support going after a helpless group durring a wedding. EXOSES what kind of cowardly criminals the brotherhood is made of. it could be that the attackers lost their dear ones at Rabaa?